A prominent citizen of Concord…Whenever the town of Mont Vernon was mentioned… would scowl and express himself thus: Mont Vernon! Mont Vernon! It was nothing but a community of savages before the advent of Dr. Adams, whose coming brought civilization into the town. Doc’s older brother, Darwin, was born in 1801, followed by two girls (one died in infancy, the other died at age 10 when Doc was 6). Daniel Lucius (Doc) was born in 1814 followed by Doc’s sister, Nancy, in 1821. It is not known where Doc received his earliest schooling but by 1827, at age 12, Doc was enrolled and boarded at the Kimball Union Academy in Meredith, New Hampshire. By late 1828 (or early ’29) he was attending the Mt. Pleasant Institution in Amherst, Massachusetts. It was at Mt. Pleasant and Amherst that Doc made the acquaintance of Henry Ward Beecher* with whom, in later years according to oft-repeated family stories, he played flute duets in New York City. Beecher was two years ahead of Doc at both schools and both played the flute; these facts are confirmed. But attempts to substantiate the duets have been unsuccessful. Beecher was a famous abolitionist and pastor of the Plymouth Congregational Church in Brooklyn during most of Doc’s New York years. Considering Doc’s strict Congregational upbringing and his father’s regular urgings for Doc to be part of the various religious revivals (particularly in the 1850’s), it is likely the acquaintance was renewed during their overlapping residence in those two cities. In 1839/40, Doc moved to New York City and began to play base ball** with the New York Base Ball Club. He also set up his medical practice and was appointed a vaccine physician for the City (for which he was paid $400 a year). He also volunteered his medical services at the New York Infirmary for the Poor. The New York game was played by young lawyers, doctors, merchants, bank clerks and others who could leave New York twice a week at 3:30 pm. Originally formed in 1839 and called the New York Base Ball Club, “…it had no very definite organization and did not last long.”¹ Some of the younger members of the Club got together and formed the Knickerbocker Base Ball Club, on September 24 , 1845 [with by-laws, a constitution and playing rules].” …. About a month after the organization of this club, several of us medical fellows joined, myself among that number.”¹ Adams and the other members of the club played base ball for exercise and its health benefits. The style of game being played was closer to a “country club” activity than to a modern baseball Club, the social aspect was nearly as important as the sporting aspect. On June 19, 1846, Doc (the obvious nickname Daniel acquired during his time with the Knickerbockers) played in what is sometimes referred to as the first modern game of baseball (at the Elysian Fields in Hoboken, New Jersey) against the New York Club: the Knickerbockers lost 23-1. Doc scored no aces/runs and had one “out”. One month prior, he had been elected Vice-President of the Club. The first five years of the Knickerbocker’s existence were the hardest. Playing equipment was an early issue; Doc stepped up to the plate and took it upon himself to make all the balls for the Knickerbockers (and for other teams as they were formed). Doc is credited with creating the position of shortstop in 1849/50 because the very light-weight balls would not carry into home base from being tossed from the outfield. According to his son, Roger, shortstop was Doc’s favorite playing position. Historical records of the Knickerbockers’ matches show that Doc also played first, second and third base.⁴ According to Doc, he was never a pitcher. He was a left-handed batter and was known to take some satisfaction in hitting his ‘at bats’ into the Hudson. His fellow teammates were less enthusiastic: they were paying him to make the balls! The outcome of this convention was voted on and approved by the Knickerbockers at their annual meeting in April 1854. 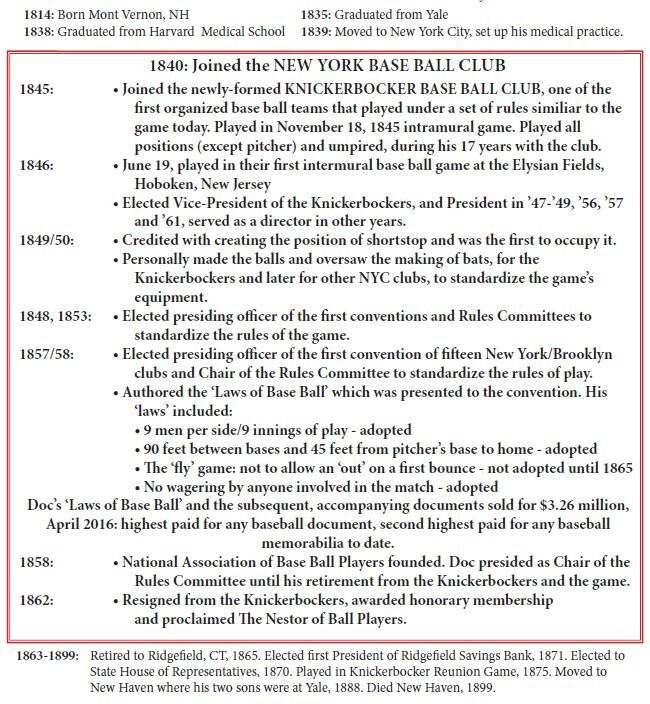 By the end of 1856, there were twelve teams in New York and Brooklyn and in December, at a special Knickerbocker meeting, the Club (Doc was President) resolved to call for a convention of these teams for the purpose of standardizing rules and play. Again, by resolution, Doc and two other teammates were appointed to form a committee and call for a thirteen team convention. This convention was held in May 1857 and Doc was elected presiding officer. One of the significant resolutions passed at this convention was nine players per side of play and nine innings of play: the team ahead at the end was the winner, and no longer 21 aces/runs. “Adams…was immediately named an honorary member and presented (in 1863) with a set of resolutions thanking him for his long and meritorious service to the club.”⁵ This proclamation/resolution (The Nestor* of Ball Players) was presented in 1863 to Doc as “a most gorgeously engrossed”² scroll. And so, Doc’s active participation in the game he loved and over which he had a significant and pioneering influence came to a close. *A King of ancient Greece who advised the Greeks at Troy; a patriarch in his field, wise counselor, or leader. ¹ Dr. D. L. Adams Memoirs of the Father of Base Ball – The Sporting News; February 29, 1896. ² Nestor of Ball Players by R. C. Adams [Doc Adams’ youngest child, 1874-1962]; Buffalo, New York; August 1939. (unpublished). ³ Baseball in the Garden of Eden by John Thorn; p. 33 and p. 116 respectively; 2011. ⁴ Baseball’s First Innings by William J. Ryczek; p. 226-233; 2009. ⁵ Adams of the Knickerbockers by Robert W. Henderson; undated and unpublished; Paul J. Reiferson, Weston, CT (courtesy of John R. Husman). Baseball’s Pioneers: The History Of The Knickerbocker Baseball Club, 1845-1866 by Charles Peverelly. Originally published in: Book of American Pastimes; 1866. We have hung some of the pictures – have the Resolutions [*] as large as life in the dining room – the glass was cracked in coming up –the only one that was injured. All that we packed came up safely, and we consider ourselves now quite adept in the art. *This, of course, refers to the Nestor of Ball Players resolutions which is approximately 17 x 23, unframed. One has to wonder how this young woman, decorating her new home, felt about hanging such a “large as life” picture (and decidedly unfeminine subject and image) in her “formal” dining room! In the same tape recording, Roger reminisced that when he was a boy, his father often joined his two sons and their friends in their backyard base ball games and even made the balls for their play! (Doc was in his late 60’s-early 70’s!) According to Roger, his father soaked the balls in a bucket of water to shrink the leather which made the balls harder. While Doc no longer practiced medicine and considered himself fully retired, he became an involved, prominent and respected citizen of the town. In 1870, he was elected to one term in the Connecticut State Legislature. In 1871, he became the first President of the Ridgefield Savings Bank (now the Fairfield County Bank where his photo still hangs in the lobby of the main office), a position he would hold in two separate terms for ten of the next fifteen years. He was the first treasurer of the Ridgefield Library (founded in 1871) and involved in the Land Improvement Association. He also played flute duets with Walter Avery both in Ridgefield and on Long Island at Mr. Avery’s home. Mr. Avery was a former Knickerbocker teammate and a distant cousin of Cornelia’s. In 1875, at the invitation of his former Knickerbocker teammate, James Whyte Davis, Doc returned to Hoboken for a reunion base ball game to celebrate Davis’s twenty-fifth year with the club. Doc was the catcher for the older members of the club who played against the younger members. They managed five innings of play before ‘retiring’ to Duke’s Hotel for a meal and no doubt toasts and the sharing of stories of the old days! It was Doc’s last known visit to New York and Hoboken. In 1888, Doc moved the family to New Haven because of the financial sacrifice of having his two sons, Francis and Roger, at Yale. He wanted to keep an eye on them to make sure they were studying hard enough! It is believed the boys lived at home which saved the expense of boarding. The current of my life has been very quiet and uniform, neither distinguished by any great successes, or disturbed by serious reverses. I have been content to consider myself one of the ordinary, every-day workers of the world, with no ambition to fill its high positions, and have no reason to complain of the results of my labor. The condition of my health has prevented active employment for several years past, but life has passed very pleasantly in the midst of a thoroughly united and happy domestic circle. Other than raising and nurturing their family, very little is known about Doc and Cornelia’s New Haven years. Doc passed away on January 3, 1899, Cornelia in 1902. They are buried in New Haven. My marriage was the crowning achievement of my life.